I just finished reading Matthew’s new book last night. I have to tell that I believe this book is a must have. I love to learn through case study and other people’s real life lessons. I felt the book tells a wonderful story of how Matthew, Wes and Richelle run the lease-option business and many lessons (good and bad) learned along the way. Many people, whether beginner or more advanced lease-option investors will be able to relate first hand of the story and information and benefit from it. And I think every boot camp graduates should get a copy to jump start their business / or improve their existing business. Here is the review I wrote on Amazon.. I have been a passive real estate investor who invested in many real estate deals with millions of dollars over the past few years with my own money and investor’s money. I also attended a $5,000 for a 4 days real estate boot camp that specialized in lease-option strategy. I have to tell you that Matthew’s new book “Essential Lease-Option Lessons” is a must addition to your library if you are a real estate investor, whether you invest in lease-option or other type of real estate transactions. I am a big believer that it is faster and cheaper to learn the “experience” from other people because success leaves clues. This is why we study “history” in school to understand “his story”. By learning from other’s people, both successful and painful lessons, we can model after what’s working while avoid making the same mistake. 1) How long to set the option period? I have asked many people this question in the past, but never got a very complete answer. 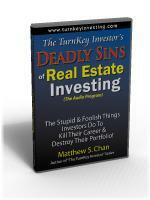 In the book, Matthew will tell you why he likes to set a two years option term. 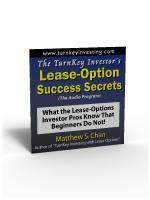 2) Do you know what is the number one killer of the lease-option? Vacancy costs! 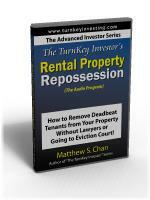 I have to learn the hard way when my first lease-option property did not move for 4 months. The key is to project the vacancy costs and have enough reserve in place to support the cash flow of the business. This book is quite easy to read, perfect for busy people who want to learn the lessons quickly. 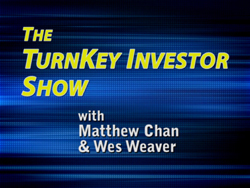 Matthew tells wonderful story about how he and his partner Wes manages their lease-option business and many lessons (good and bad) learned along the way. Add this book to your collection today! It will cost you much much more to learn this on your own (by going to seminars, learning from other mentors and makes many mistakes along the way). Matt has again provided a great addition to his growing investment series. 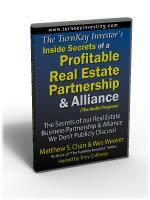 This book provides insight, case studies, examples on various transactions he has been involved in – both good AND bad. I remember hearing from Matt just after we met a few years back, he was telling me how much he concentrated and learned from mistakes and bad transactions (although these are very rare for him). As a new investor, I kind of had the “forget about it quickly and it won’t hurt as bad” strategy when I ran across losing propositions or actually lost money in transactions. It was definitely a good learning technique to know that Matt profits in EVERY SITUATION – either monetarily or in education. This is a great book for any investor, well written, concise, easy to read with GREAT information throughout. Lessons that Everyone doing RE investing (esp. L/Os) Can Use! 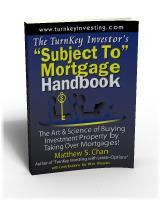 This book is a must have if you are going to invest using Lease Options, but it contains great advice for conventional landlords as well. 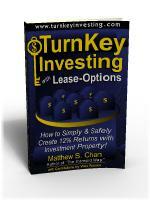 Early on in the book the author starts to call it TurnKey Investing with Lease-Options Part II and I can see why!! 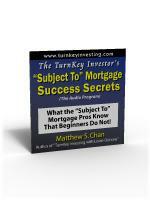 In the first book the author talks about the “How To”, but in this book he provides the lessons which ALL real estate investors can take knowledge from. I found this the most interesting for a number of reasons, he details the problems in the painful and not too painful basket, and some of the painful are one all investors should be wary of. He also provides a ‘small’ snapshot of his portfolio so you can see how the figures work for different types of property as well as some good commentary regarding properties that have higher cashflow vs. those that have a higher capital gain and the benefits of each one regarding Lease Options. I really think people will enjoy this book, the lessons you can learn from it can save you much heartache, trouble and money. As a new investor, I was searching for more than “text book answers.” I played a lot of competitive team sports when I was growing up and there is an old saying, that, “Every play works every time on the chalkboard.” And according to the text books, you would be led to believe, (naively, I might add), that if you simple “follow the guidance you read or hear,” that real estate investing works every time. The truth is that it doesn’t. Most of us innately know that it doesn’t. But exactly when, where and how does it go wrong? Thank you, Matthew Chan, for sharing the true, behind-the-scenes, unmitigated realities of your ups-n-downs, victories and defeats, good luck and misfortunes. You’ve done more than just tell stories. Your case studies are the equivalent of “studying the game film” as they examine the many aspects involved in your execution in relationship to your plans and expectations. Sharing your real estate investing experiences, specifically relating to lease-options, but with much broader implications, is making people like me aware of the “do’s and don’t” and giving “real world insights” to many of us who previously understood only investing theories, lacking those “doses of reality” that the text book gurus don’t tell. And if you don’t mind me saying this, you’d make a terrific coach.